I feel like all I ever show you is pasta. You’re welcome? But this one is different because there’s a major MAJOR James Bond trickster secret I pulled in it. Well, to be fair, Aaron first pulled this trickster secret on me, causing a no-way-you’re-kidding-smoochy-high-five-flip out, thus propelling my neurotic interests into overdrive, causing me to pull this secret of such titanic magnitude on you all. But I’m going to tell you now, because I’m lovable like that. <—- gross. So here we go: there are two kinds of meat in this sauce. 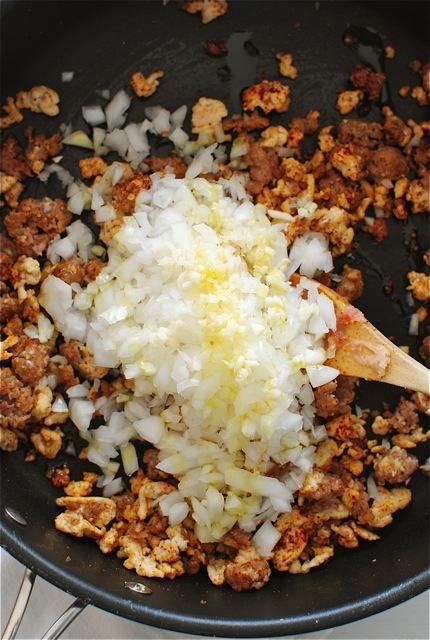 Half Italian sausage, for the flavor, and half ground chicken, cutting the fat down. HA-BIGGID – oh you do this all the time? Well it made me squeal with utter felicity, so there. 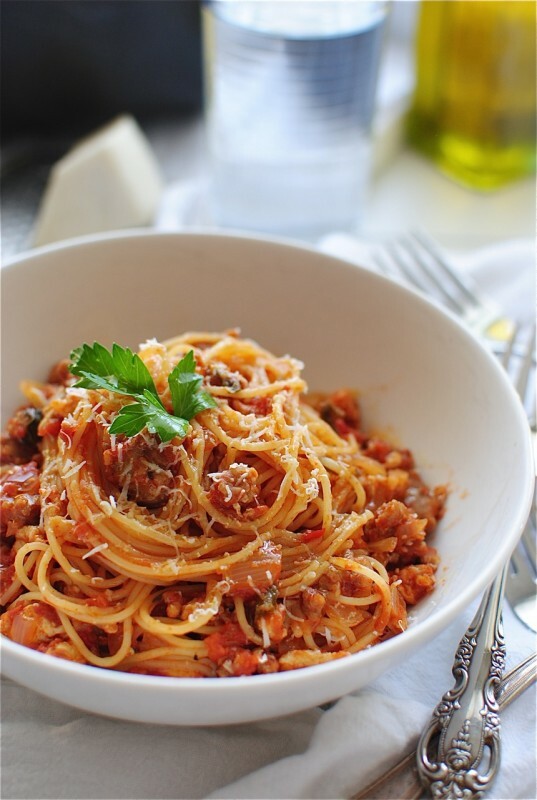 Another thing, for this dish, I’d really stick with angel hair pasta. There’s just something so delicate and silky about it in this specific sauce. The sauce with two meats in it. The one for flavor and the one for health. Remember the sauce I was telling you about? Oh, you’d rather talk about something else? Okay, so we watched Tucker and Dale Vs. Evil this weekend. Have you seen it? O-M-G, hysterical. I feel like this year these are the only types of Halloween movies I can take, with the babies and my hyperactive nerves and all. I mean sure there are wood chippers and chainsaws and murders in it, but not like that. It’s actually fun to watch all the death! And that sounded creepy. You just have to see it. The end. You know what else you have to see? 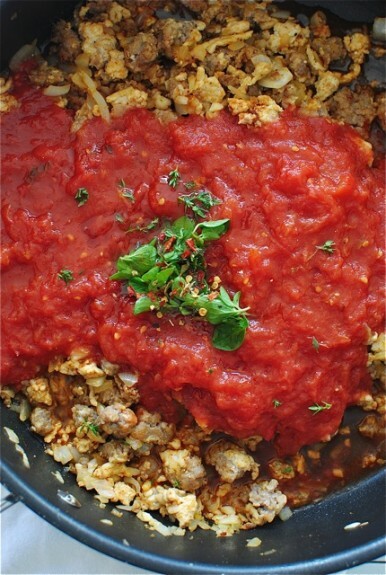 How delicious two kinds of meat can make a tomato sauce. One for flavor and one for health. And I stand by it. Did your mouth just fall off your face? Heat a large skillet over medium-high. 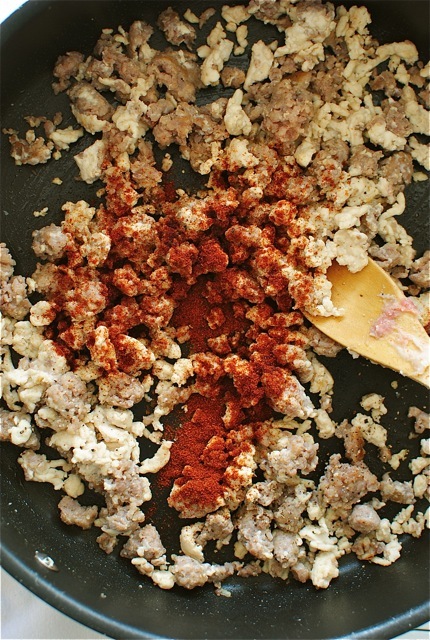 Add the Italian sausage and start to brown it in the pan for a couple of minutes, releasing some of the fat. Add the ground chicken and keep browning the meats, another 5 minutes. If you need to add a tsp of oil, do it. Add the smoked paprika and a pinch of salt and pepper, cook another minute. Add the onion and garlic; sauté until the veggies start to get tender, 5 minutes. Add the tomatoes, herbs, crushed red pepper and honey; simmer on medium (partially covered) for about 20 minutes, stirring every few minutes. Add the milk and simmer another 5. Taste it. Need anything? More heat? More salt? If you want it creamier, a little more milk? Do yo’ thang. 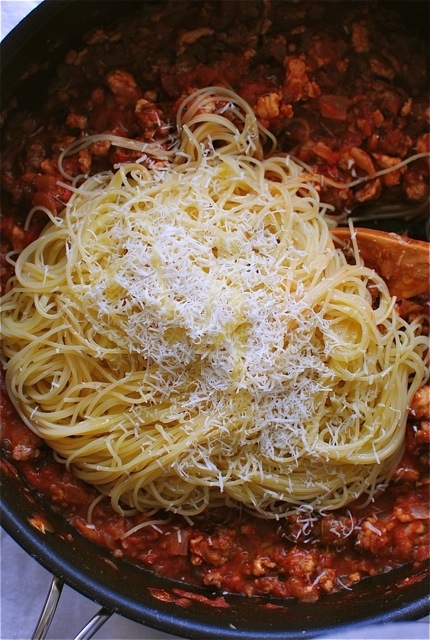 Off the heat, add the cooked pasta, cheese, and a nice drizzle of olive oil. Toss toss toss to combine. Taste it one more time. UGH, I know. Garnish with fresh parsley and serve with crusty bread which I forgot to photograph because pregnancy. By the way, there are TWO kinds of meat in this sau- okay. 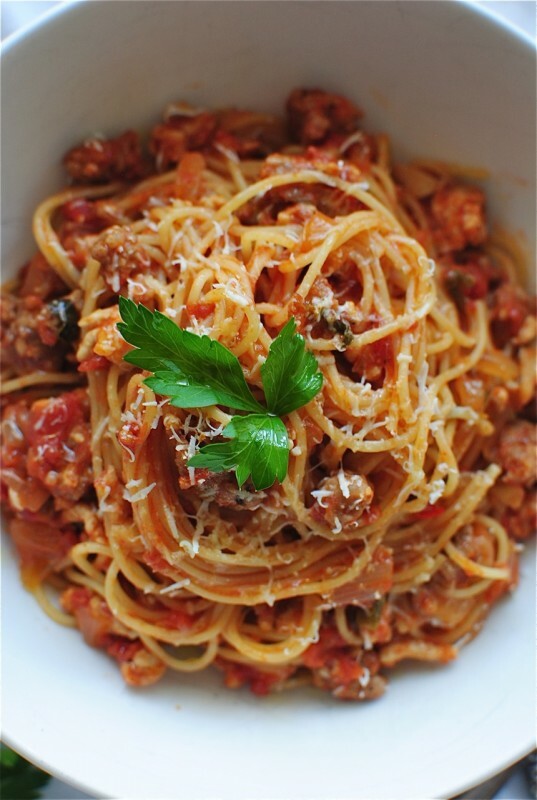 This pasta looks delicious! I love angel hair! Look at you adding honey thinking no one would notice!!! You fancy, huh!? Oh this looks like a whole bowl of tasty. Use half spicy sausage, half meat almost always! My family really love spicy, so it is a great balance. Plus, I am huge lover of angel hair so this is so my thing! I love the sausage and chicken combo! 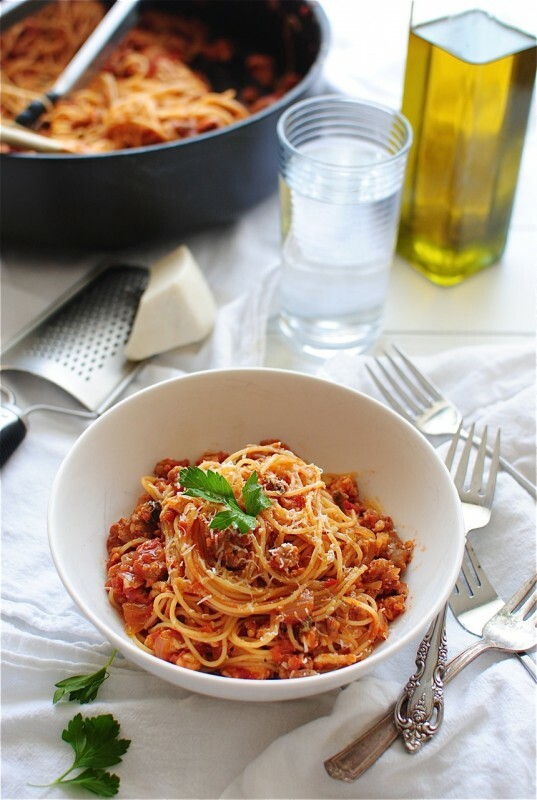 This looks simple and super, super tasty! I want to eat this for every meal. YUM! Oh Hey prettiest pasta I ever did see. You come around these parts often? 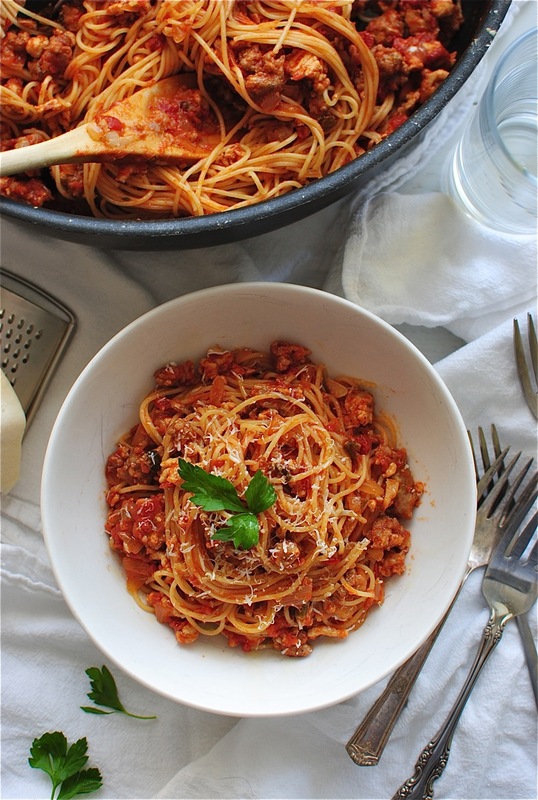 I love this tomato meat sauce. It's even better that is has TWO meats. WHOWZA! I was just thinking about making pasta for supper this week... thaaaank ya! Pinned! Mmmmmmmmm. Pasta. Always good. This looks delicious. And sounds. I stumbled across that move last year and it was like the most amazing surprise ever. " Officer, its been a doozy of a day". Instant fave. p.s "When you see a college girl prancin' around in front of you half naked, you do not call out my name!" This would totally be worth the heartburn. Dang baby sitting on my esophagus...or something. yes this needs to be in my face right now. Bev, this was fabulous! My husband said it was the best pasta dish I'd made in a while---possibly ever! I need maybe two plates of this right now, YUM!!! Made this, and was a huge success! Definitely printing this one out to use again and again.